Chicago is, as they say, having a moment. The Cubs won the World Series, the city's skyline is being immortalized by LEGO and, thanks to NBC's Chicago-centric lineup, it has become one of the country's top filming locations. With the Windy City getting extra screen time, more and more fans are making the trip to the city to see their favorite locations in person. Here's a look at five of famous Chicago filming locations that are quickly becoming tourist traps, too. 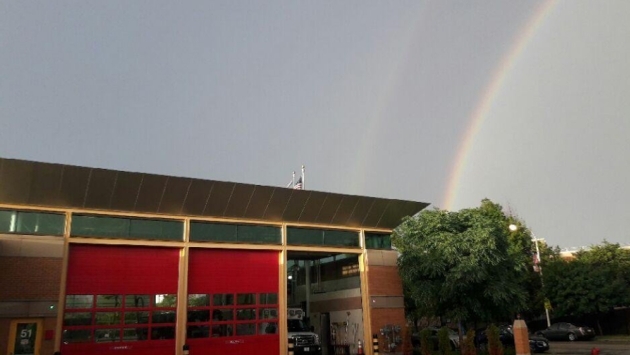 The fire station featured in "Chicago Fire" has become such a popular destination for fans of the show that it has its own Facebook page and the real firefighters at the station are almost as famous as the actors who play the firemen and women on the series. The firehouse, located at 1360 S. Blue Island Avenue in Chicago, remains a frequent filming location for "Chicago Fire," too. Though there is no way to tour any of "Chicago Fire" sets during filming, fans are allowed to watch from afar and may even be able to meet some of the show’s stars between takes if they do happen to be filming. Many fans have visited the firehouse even when the show isn’t shooting and still seem to have a blast taking photos and meeting some of the folks who work there. Another locale made famous by "Chicago Fire," Lottie's Pub attracts fans from around the world thanks to its role as Molly’s on the show. A few years ago, the "Chicago Fire" crew rebuilt the interiors of Lottie's on the series' soundstages so it's unlikely fans will see them shooting inside, but they do still film exteriors at the bar on occasion. Fans shouldn't be afraid to grab a beer and a pizza in one of the show's best filming locations — you won't be the first. You can find Lottie's at 1925 W Cortland St., Chicago. The Gallagher House from "Shameless"
Another Chicago-set TV show that has recently raised the city's on-screen profile is "Shameless." Filmed mostly in Los Angeles, the show does make its way to Chicago for one or two weeks a year to film exterior scenes at many of the now-famous locations, the most popular of which is the Gallagher house. The modest house at 2119 S. Homan Avenue didn't seem destined for stardom but now, even when the show is filming there, it isn't unusual to spot fans driving by or taking photos of this private residence. And, according to the show's star Emmy Rossum, the home's fame has sparked an interest in the film industry for the real-life family that resides there. "I ran into the little girl today, she said she was 12 so that means I've known her since she was 5, and I saw her sitting next to our director-producer with headphones at the monitors and watching," Rossum said. "She was talking about how she was interested in the film industry and it was so cool that we got to give her that experience." While TV fans flock to "Chicago Fire" and "Shameless" locations around the city, most movie fans will go out of their way to pay a visit to The Art Institute of Chicago, home to what is arguably the most famous scene ever filmed in Chicago. Like the thousands of "Rocky" fans who run up the steps of the Philadelphia Museum of Art, "Ferris Bueller" devotees can't help but strike a pose at the Art Institute, just like they do in the movie. And, finally, at the top of Chicago's most recognizable landmarks is Navy Pier, thanks in part to the many films the pier has been a part of. "The Dark Knight," "Never Been Kissed," "Divergent" and "The Lake House" are just a few of the film productions that have used Navy Pier as a backdrop.